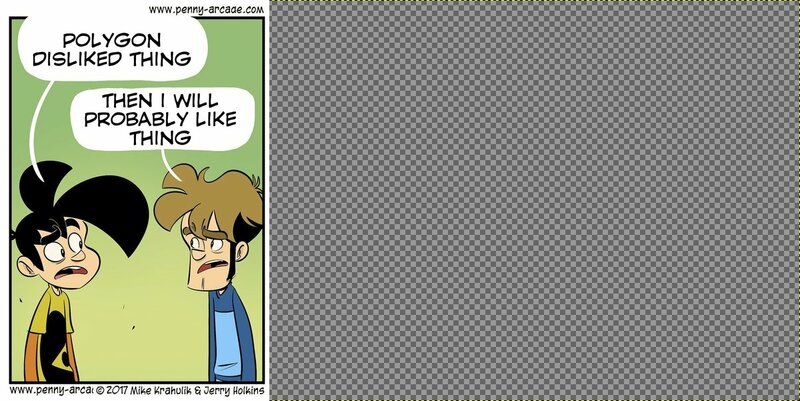 I see some people are having a hard time interpreting this Penny Arcade comic, and so I figured I’d try and help you out here. 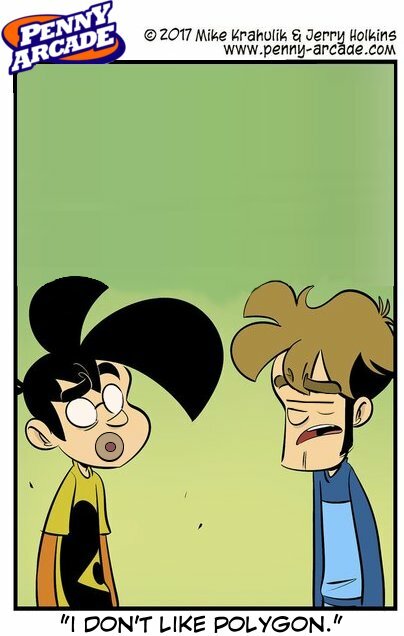 I am, after all, an academic, exactly the kind of person that Penny Arcade love to bash for our difficulty understanding their intricate, street-level Derridan medium, so I figured it was best to conduct some study and provide a clear, explored version of their original text for other people to consume. I hope this deciphers this intricate political statement and is worth the years of study. It’s a difficult puzzle to solve, and you can see here how they’ve cleverly used the rhetorical device of repeating themselves three times to ensure that we clearly understand their joke. 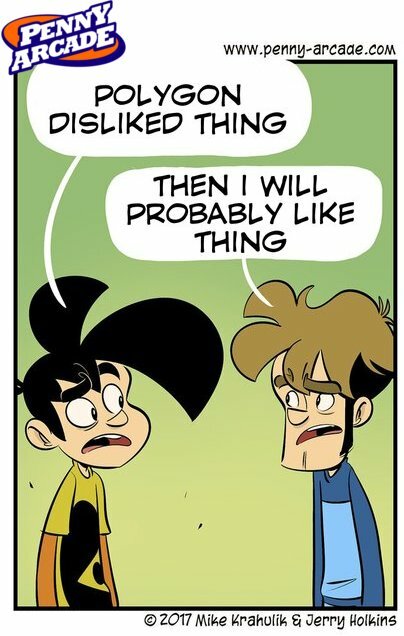 Now, conventionally, comedy would dictate that you don’t belabour your joke – that you make your point, deliver the joke sharp and smart (like a ‘punch’ line, as it were), but the Penny Arcade magnates are proud and above such things. 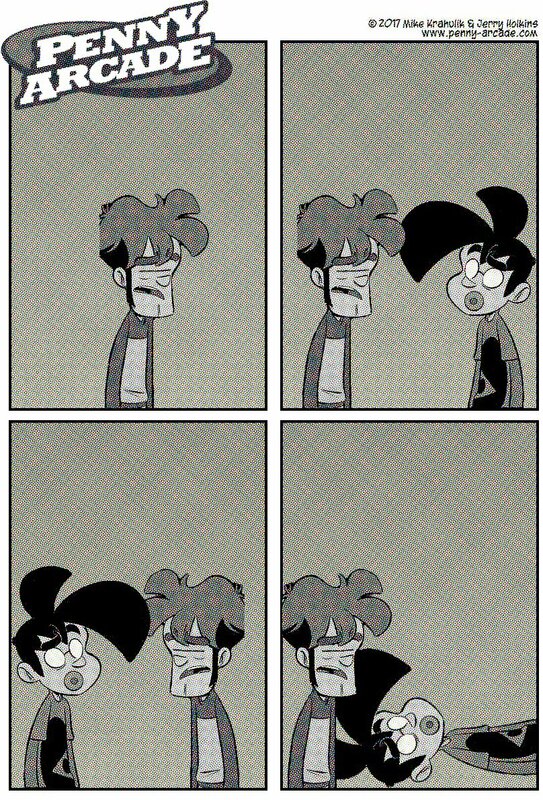 They instead opt for this very advanced form of comedy where they restate their joke repeatedly. 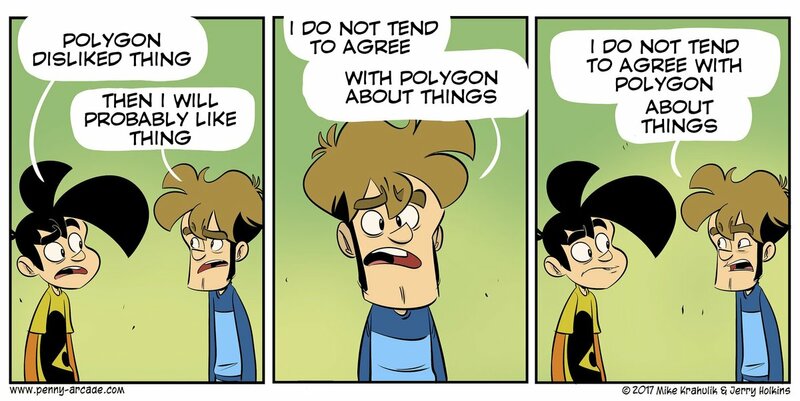 Some people have argued the original third panel was actually mocking the idea of people caring about politics, which is kind of true, but only in that it’s meant to be mocking Polygon for its daring to care about this as it relates to clearly ridiculous things. 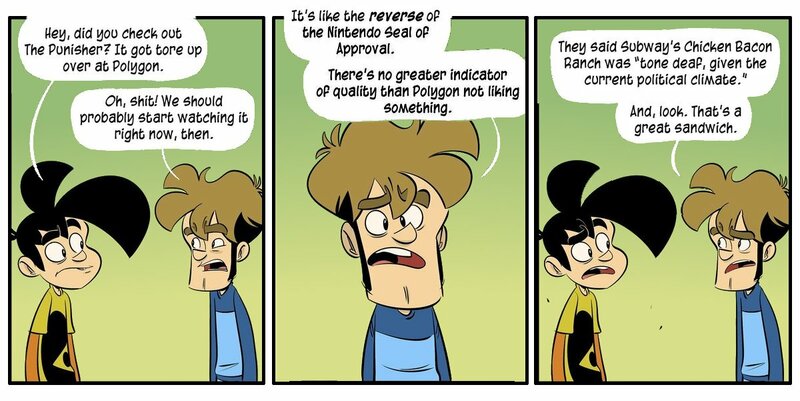 That is, they believe that the source, Polygon, is wasting its effort and energy on things it shouldn’t be doing. Like this. Now, when I see things like this, I think we all recognise that the true greatest genius of 90s comics, and genesis of most webcomic as a genre was the work of Gary Larson in the newspaper single-panel comic The Far Side. Of course, Larson was a believer in, and advocate for active minimalism in comedy. 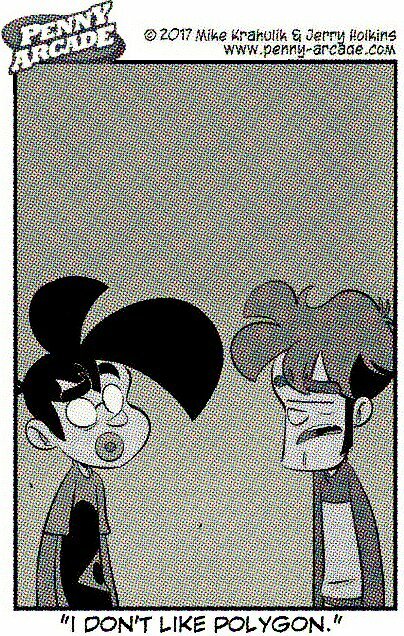 It stands to reason when you’re working for an editor and need to turn around your comics quickly for quick redraws and re-works, you might favour a style that’s very clean, and avoids excessive extra lines or notes, and makes the small space you have maximally expressive. As you refine the process, you realise how little of what you need is useful. You start to appreciate how much you can express with a small number of narrative and visual tools. The chaff you thought was essential melts away and you’re left looking at what you’ve chosen to present, and how, in its purest form. Anyway, I think we’ve all learned something today.